Awarding You designs and manufacturers hundreds of custom awards every year. It’s easier than you think, and often less expensive than you’d expect….but it does generally take more time than a stock or semi-custom award project. See our Custom Award Photo Galleries listed at the bottom of this page! We design and produce hundreds of custom award designs for organizations every year. From one award shaped like a torch that was presented to an Olympian, to hundreds of awards shaped like a cloud for employees working on a new product launch, we can help turn your idea into a reality. 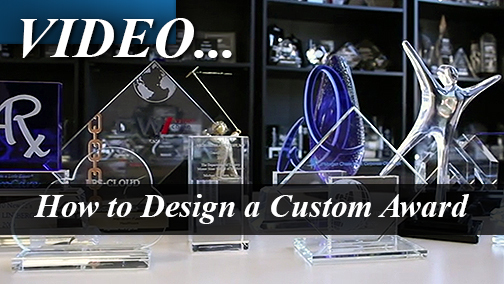 Here's how our custom award design process typically works. We also have a 4 minute video on our process with tips and ideas. To start, we’ll need to get some basic information about what you’re looking for, how many you need, when you need them, your budget and any design elements that you’d like included. We have an in-house team of graphic artists that work with our engineering team to create custom award designs for our clients. We’ll take your project background information and brainstorm on shapes, sizes, colors, and components that might work for your project. The graphic artists will then create a group of concept designs from these meetings. Our engineering team will review and revise the concepts for manufacturability. And finally we’ll compile pricing and timeline information. We’ll present these to you for review and input. Generally we need 1-2 weeks to create concept designs, assemble pricing and generate production timelines to present to you. Production timelines depend on the materials chosen, quantity, assembly and finishing requirements on the product. Custom award production generally ranges in the 6-12 week timeframe, making them most applicable when you’ve started your project well before your event. There are options for expedited service with custom products when your time is limited. Many custom award projects go directly into production when the design is approved because of the longer production time. However, if your project timeline allows, we can often provide samples of the award for review. Sometimes these will be first production samples, sometimes they will be partial samples for color, size, or shape approval. Generally samples will take 3-4 weeks to create. Many of the custom awards we’ve created are in the same price range as our stock and semi custom products, making custom awards affordable for most clients. Custom products vary widely in price, depending on the size, quantity, and materials used. We make every effort to provide options that meet your budget requirements, sometimes offering alternative materials, sizes, and finishing options. If you have any questions, or would like to design a custom award for your organization, call our Customer Service team at 800-753-3384, or email us today! We've organized our Custom Award Photo Gallery into award categories, please click on the links below to browse various custom award examples.